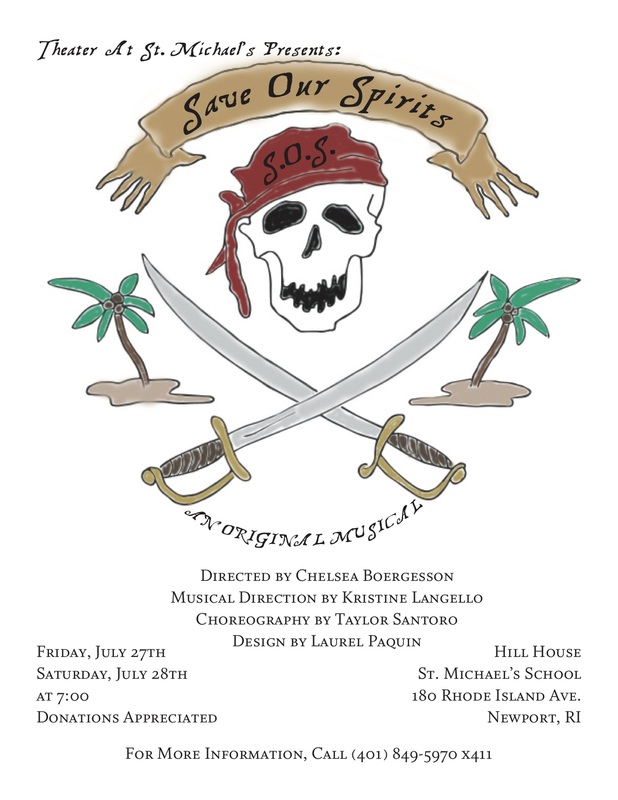 Theatre at St. Michael’s is proud to present an original musical entitled “SOS – Save Our Spirits“ on Friday, July 27th and Saturday, July 28th at 7:00. This performance will feature actors ages 9 – 15, who have spent the past three weeks writing and rehearsing a show of their own creation, supported behind the scenes by tech campers who have built the set and will run technical aspects of the show. The group worked with writing coach Andrew Katzman to conceive a musical about an island paradise guarded by benevolent spirits which gets overrun by treasure-seeking pirates. Through a bit of adventure, lush musical numbers and energetic dances, the motley crew learns their lesson about selflessness and community. Campers are largely responsible for writing the original songs, and also helping to design and build the island paradise set. Chelsea Boergesson is directing the show, Kristine Langello is musical director, choreography is by Taylor Santoro, and technical direction is by Laurel Paquin. The performance is in Hill House Arts and Athletic Center at St. Michael’s School, and is free and open to the public, with donations welcome at the door. For more information, please contact Christina Johnston at (401) 849-5970 x 411 or email at cjohnston@smcds.org.